Trying, perhaps a little unconvincingly, to deny he was in pain, Hight capped a whirlwind 15 days by driving (and completing back-to-back triumphs at his Auto Club sponsor’s branded races) with a broken left collarbone. His injury was the result of a massive engine explosion that engulfed his Chevy Camaro in flames while sending it crashing into the wall to his left just after he clocked the winning time during the final round of the AAA Insurance Midwest Nationals at Gateway Motorsports Park in Madison, Ill.
And with custom-crafted padding installed in the cockpit, he gamely won the next race, the AAA Texas FallNationals in Ennis, Texas,, and led the standings with three races remaining. Hight proved him right, saying a few days later, “It has been a long week and a half. The worst feeling was the slim chance that I could be on the outside looking in. That wouldn’t have been any fun.” That mindset might have seemed foolish — but only to anyone who doesn’t know auto racers. So, really, all that was nothing new or startling. But the experiences Hight endured and his insistence on returning immediately to the cockpit of his John Force Racing machine underscored his commitment to the sport, to his responsibilities. He followed his heart years ago when his parents disapproved of his decision to make his living in drag racing. And he followed his heart in late September not to miss a beat and to return to his car just nine days after surgery. The accident occurred Sept. 23, and he underwent surgery Sept. 26 for “a left clavicle open reduction and internal fixation.” He received clearance from Dr. George Hatch , an associate professor in the Department of Orthopaedic Surgery at USC’s Keck School of Medicine, on Oct. 4, just one day before the start of the Texas event. Hight qualified in the top half of the 16-car Texas field, at No. 6. And that was in a new car his team had built while doctors in Southern California were putting him back together. Just to make sure he didn’t injure himself further, Hight wore a specially designed apparatus that would keep the shoulder restraints from pushing on or rubbing against his collarbone. Pro Stock racer Greg Anderson had undergone heart surgery in 2014 and Simpson Racing had crafted a unique padding for him. Hight and his team modified it. 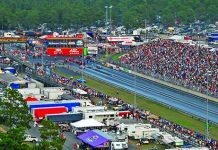 Hight already has inspired every NHRA pro driver in every class as the only one ranked 10th and last the title-eligible lineup ever to march to a championship. Now he can inspire racers with his true grit. With 46 years in sports journalism, Susan Wade is a veteran drag-racing writer with 21 seasons at the race track. Capturing the human-interest element is the trademark of the Indianapolis native.